Chapter 1 outlines the problem statement, objective and scope of work. The background of the study area is described in Chapter 2. This chapter presents the location, topography, climate and land use of the study area. Chapter 3 reviews previous studies carried out in the study area by other consultants. Chapter 4 reports the data collection works being carried out to acquire the data. Chapter 5 describes the existing drainage system. This chapter highlights the present condition and the evaluation of the existing drainage system in the study area. Chapter 6 gives the stormwater management concept of MSMA, which will be adopted in the study and detail design. Chapter 7 consists of the outline of stormwater management and flood mitigation plan. Chapter 8 explains the methodology and processes of hydrological and hydraulic analysis and modeling. Chapter 9 delineates the project scheduling and costing for all proposed flood mitigation components. Appendix A is the terms of reference, Appendix B is the inventory form, Appendix C is the soil investigation, Appendix D is the tender drawing and Appendix E is the cost estimation of this study. Kawasan Perindustrian PKNK Bukit Kayu Hitam is located at Bukit Kayu Hitam, Kedah's main border town on the Malaysia-Thailand Border. The industrial park is one of the main economic hub in the area, housing important industries and factories. The industrial park was developed by Perbadanan Kemajuan Negeri Kedah (PKNK) and is still managed by the company, which is a business subsidiary of the Kedah State Government. 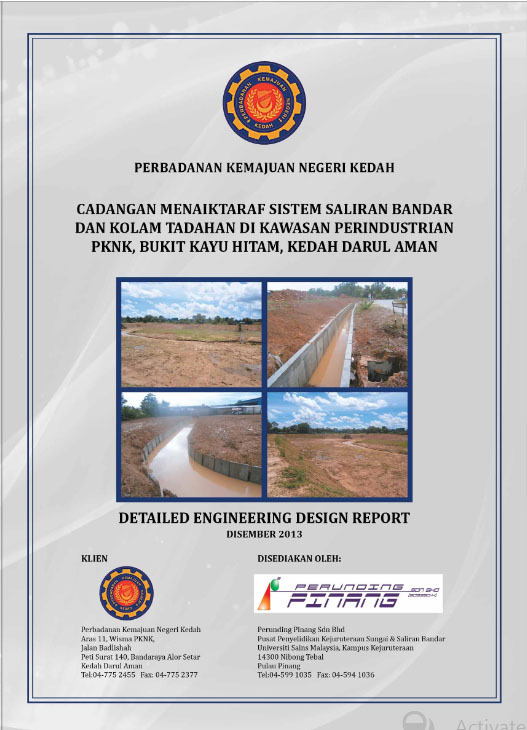 PKNK received several reports and complaints from the industrial park occupants and investors in regards to the flash flood issue in the area. Flooding frequently occurs since year 2006 and the latest occurred on 07th March 2012. A total rainfall depth of 168 mm over a 2 hours period has been recorded at Bukit Kayu Hitam Rainfall Station (MADA’s station) for this event. It involves the upstream area of the catchment which includes Black Forest Golf & Country Club and its surrounding area. Among the worst hit areas include the Asian Composite Manufacturing (ACM) Sdn. Bhd., which suffers flood damage in the count of millions of ringgit. A round table discussion held among PKNK, ACM Sdn. Bhd., and other related government agencies had identified the cause of flooding. It was concluded that the 3.5m x 3.5m channel flowing in front of ACM Sdn. Bhd. could not cater to the runoff coming from various sources around the catchment. One of the sources of runoff is actually the catchment within the PKNK Industrial Park. Runoff from upstream development (factories along Jalan PKNK 6 and Jalan 7) was collected and discharge into the said main drain at a single location. During peak of event the excessive runoff would form water jets, landing water directly into ACM Sdn. Bhd. compound rather than into the drain. Therefore, an improvement of the drainage system is imminent to improve the situation and prevent further flooding. PKNK proposed to divert the said catchment so that it discharges directly downstream, by-passing the said under-capacity channel. It is on such approaches that PKNK is inviting Perunding Pinang Sdn Bhd. 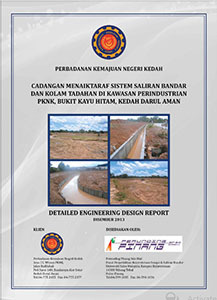 (hereafter refers to as the Consultant) to prepare the technical and financial proposal for Cadangan Menaiktaraf Sistem Saliran Bandar dan Kolam Takungan di Kawasan Perindustrian PKNK, Bukit Kayu Hitam, Kedah Darul Aman. In response, the Consultant is submitting this technical and financial proposal after a few initial site visits to establish the basic understanding of the Client’s requirements. i. To implement stormwater facilities that give up to date solution for the flooding, drainage and stormwater management problems in the existing built-up areas in order to reduce the adverse effects of flooding on people and property and to protect the existing and proposed development by implementation of an integrated stormwater management by providing an appropriate level of affordable flood protection to community expectations. ii. To upgrade the effectiveness of the existing stormwater infrastructure network within the project area in a way that meets the needs of the community and where possible, by providing and maintaining stormwater management infrastructure at an acceptable quality of service, taking into account environmental effects and public expectations. iii. To provide control structures against excessive sediment and floatable rubbish in watercourses to acceptable levels by managing the catchment activities using at source control measures to prevent any acceleration of the rate of erosion from generated from developed areas, on land and in stream channels. i. Hydrological and Hydraulic Analysis. ii. Detailed Planning and Design. iii. Channel/Pond Bank and Slope Protection Works. iv. Working Drawings and Tender Documents. vi. Construction Supervision, Contract Administration and Commissioning of Completed Works. vii. Drainage/ Pond/ River Reserve and Land Acquisition Plans. viii. Operation and Maintenance Manual. ix. Use of Local Materials.